Departing from her usual colour schemes of neutral and bright tones, Anavila Misra took us on an enchanting journey into the dark woods. Using handwoven cotton, silk, linen, and wool, she romanticised blacks and dark grays with a graceful sheen. From Gujarat’s hand-block printing to Jharkhand’s Khatwa embroidery all weaves used were locally sourced from a talented pool of karigars. The blouses looked playful yet elegant. Launched in 2006, Craftmark, the only national certification for authentic, high-quality, ethically produced handmade crafts in India showcased a curated range of its artisanal products. Designers Anshu Arora, Hetal Shrivastav and Sonal Chitranshi presented collections in collaboration with different craft collectives, namely, the Sandur Kushala Kala Kendra, the Purkal Stree Shakti and the Nabha Foundation, respectively. The collections portrayed varying techniques such as Lambani embroidery from Karnataka, applique and patchwork from Uttarakhand and Phulkari from Punjab. All the fabrics were hand woven and not a single scrap was wasted, representing communal joy and love. 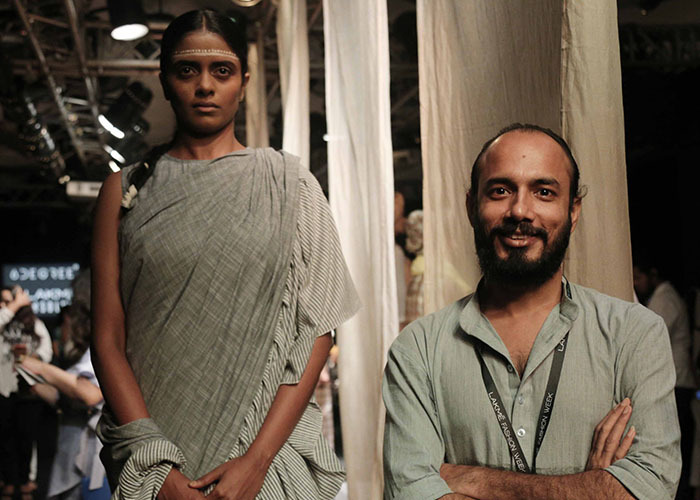 Titled ‘Irreverence’, Gaurav Jai Gupta sought inspiration from a dark chasm of ideas. It’s only fair to say he succeeded and put out a collection dedicated to journeys, far and wide. 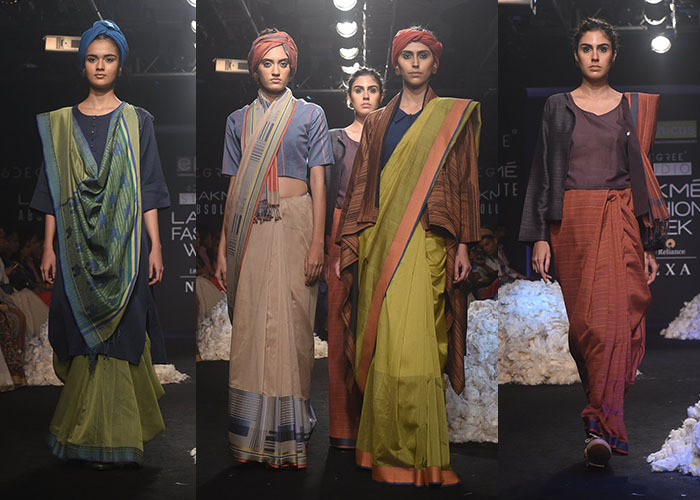 The collection consisted of beautiful urban separates, engineered saris, lehenga skirts and tops in blends of hand weaved merino wool, silk, cotton and metal with the woven pleats being developed on the loom to provide elasticity. The colour story ran across natural indigos, charcoal, glazed metal and teal. Returning to the ramp almost after a decade, one can definitely vouch for the fact that Shanker hasn’t lost her fascination with India’s craft sector. Her collection integrated many traditional crafts such as Bandhani from Kutch, Kantha from West Bengal and Bagh prints from Madhya Pradesh rendered on Chanderi and other hand weaved textiles from Benaras. The other section interpreted modern and contemporary silhouettes with clean lines. There were trousers, skirts, jumpsuits and jackets layered with ease. The colour palette was simple with a trio of reds, blacks and whites. From farm to fashion, Ethicus’ ‘Matchmaker’ collection of handloom saris, blouses, kurtas and dresses were a bridge to the colourful, geometric farmlands one sees while travelling via rail in the countryside. Created in the beautiful lands of Kabini, this cotton is ecologically sourced. The collection echoed natural colours, from soothing blues and greens to earthy browns and blacks, with striking, mondrian-like patterns. The garments at #RestartFashion were made only using post-consumer waste, a concept the world could very well use at the moment. Anuj Bhutani‘s collection was all in wool, encompassing crisp shapes and forms in shades of reds, whites and neutrals. There were jackets, shorts, trousers and overalls, each looking cosy and comfortable. Doodlage‘s ‘Dream’s and Dystopia’, was an artistic take on the speedy journey of the world at present. Relying heavily on patchwork in a gorgeous array of colours and prints, the collection was edgy, especially with distinctive head-gears. Chola‘s collection explored black, white and checks while incorporating draped elements on contemporary, anti-fit garments. 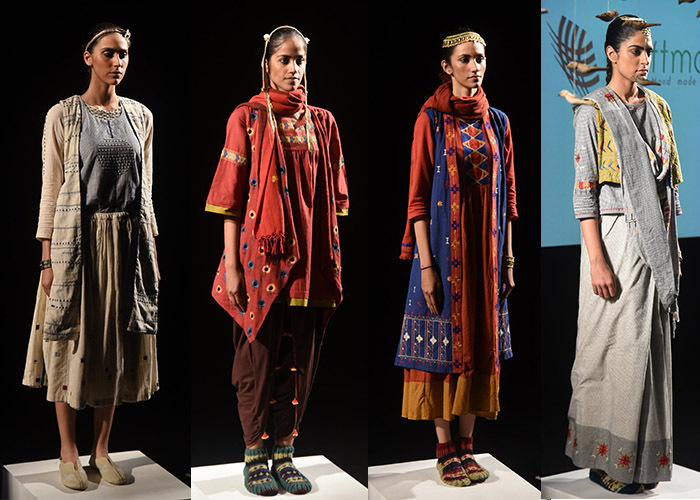 Matr showcased Khadi in a new avatar with dyeing, embroidery and printing in a variety of patterns and colours. Cropped tops with tassel details, jackets and long dresses were amongst the ensembles created by the label. Using the beautiful Khadi of Matr, Kopal’s collection was an intriguing study in hand woven fabrics with touches of western sensibilities. The designer kept the silhouettes simple with timeless appeal in the form of soft fluid shift dresses with subtle stripes. The fabrics from Matr were turned into beautiful ensembles by Because of Nature Australia that had a gentle fluid appeal. An innovative sari with a ruffled pallu was introduced along with classic neat dresses and loosely fitted jackets with pocket details. Five designer pairs came together to create a stylish jugalbandi of craft, weaves and contemporary fashion that was inspired by peace and harmony between the artisans and designers. This showcase not only highlighted the crafts but also their creative sensibilities that revealed a graceful hint of Japanese and oriental nuances to match the requirements of the season. The collection was presented in the form of separate stories named after various techniques and textiles like shibori, bandhej and ajrakh with designers like Poochki, Verandah and The Pot Plant working together with craftsmen like Shohel Khatri and Mohammed Yusuf to amalgamate their styles beautifully.